10.01.06 President Ilyumzhinov has issued a press release stating considerable progress has been made in negotiations including resolution of the bathroom issue. There still remains a number of unresolved issues and discussions continue, hence no game today. Also the FIDE president has accepted the resignations of all members of the Match Appeals Committee and will serve as the Appeals Committee himself until a new committee is formed. Both the Russian and Bulgarian national chess federations have come out in support of their players. On 29-30 September 2006, in City Chess the FIDE President has held several rounds of negotiations with the representatives of the World Chess Championship match participants. Despite existing deep contradictions in the approaches for the settlement of the conflict situation, the parties have succeeded in reaching considerable progress. Firstly, the issue of the bathrooms for the players has been solved. The team of V. Topalov has agreed for opening the bathrooms in the restrooms of the players. Also, an agreement has been reached that the players will be using the restrooms permanently assigned to each of them during the whole duration of the match. The both teams will be provided with a possibility of thorough inspection of the respective opponent’Äôs bathroom. Secondly, the members of the Match Appeals Committee with the aim of assisting to the FIDE President in finding a solution in this conflict situation and fully realizing the necessity to continue the match, have submitted a letter with their voluntary resignation to the FIDE President. The petition has been satisfied. Until the appointment of the new members and their arrival in Elista, the functions of the Appeals Committee will be performed by the FIDE President. At the same time there is a continuation of the negotiations in respect of the issues, which have remained unsettled. The FIDE President once again addresses both parties with an appeal to meet each other halfway in order to continue the match for the sake of the millions of chess fans who are impatiently waiting for the peaceful outcome of the conflict. 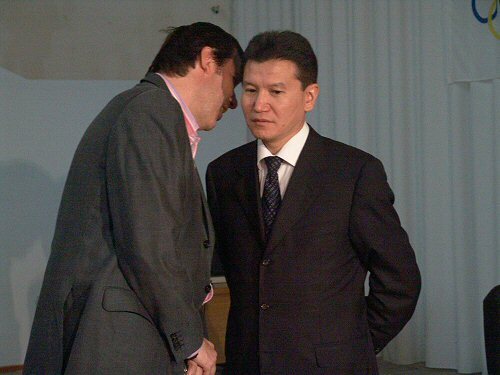 Fide President Ilyumzhinov meets the press as Topalov's manager Silvio Danailov looks on. The Russian Chess Federation expresses its regret that Grandmaster Topalov (Bulgaria), in his match for the world championship against Vladimir Kramnik (Russia), should have resorted to incorrect methods of behaviour. 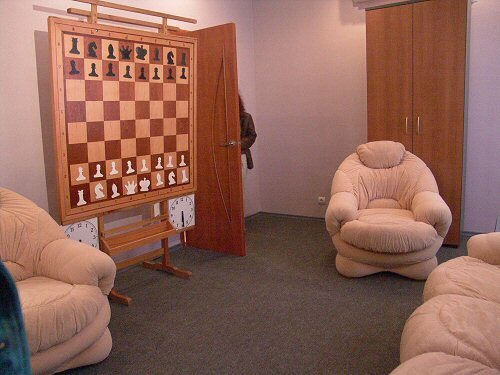 Such events should be decided in an honest struggle at the chessboard, and not by poring over video footage of Kramnik in his rest room, and counting how many times he visits the toilet. The protest by the Topalov team reflects the weakness of their playing position in the match. The cancellation, as being unethical, of the decision of the Appeals Committee to allow the video footage of the players’Äô rest rooms, taken by the judges, to be made available to the members of the two players teams. This is because we believe such action is a breach of the privacy of the players, and also allows the opposing team to see how the player thinks and reacts to his opponent’Äôs moves. The cancellation of the decision of the Appeals Committee to close the individual toilets attached to the players’Äô rest rooms. The replacement of the members of the Appeals Committee. That the match Kramnik-Topalov be continued, with the score 3-1 in favour of Kramnik, under the exact conditions in which the match was started. The Russian Chess Federation hopes that the President of FIDE and the Organisation Committee will act wisely and not allow the Topalov team to terminate a match, which has begun badly for them. We have learnt that the Bulgarian Chess Federation is firmly supporting the demands of the FIDE world champion Veselin Topalov, "so the fight for the title could continue in normal conditions that exclude all doubts for getting additional help during the games.’Äù This is part of the declaration published in the official website of the Bulgarian Chess Federation. Veselin Topalov's manager Silvio Danailov wispers to FIDE President Kirsan Ilyumzhinov during negotiations at the World Chess Championship Match.